The Caspian Sea runs north and south, extending over 1 200 kilometres, with an average width of 320 kilometres, with 7 000 km coastline. It covers approximately 400 000 square kilometres (an area slightly larger than Germany). 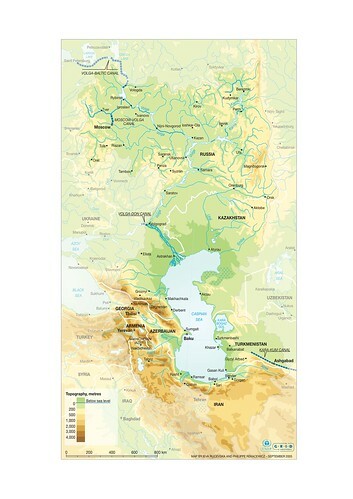 The population of the region is about 14 million, distributed over the coastal provinces of five countries: 6.5 million in Iran,3.9 million in Russia, 2.2 million in Azerbaijan, 0.8 million in Kazakhstan and 0.4 million in Turkmenistan. For any form of publication, please include the link to this page and give the creator credit (in this case IEVA RUCEVSKA AND PHILIPPE REKACEWICZ) If the high-resolution file is not available, please contact grid@grida.no for request and permission for usage.